After way too much delay (Damaging Noise Rec. strikes again? 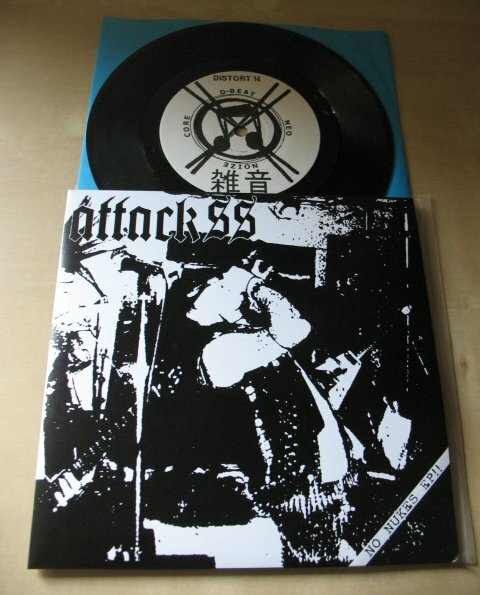 ), the long awaited second ep by Nagoya's Attack SS "no nukes ep!!" finally saw the light. Courtesy of Distort Reality Records outta Portland. Best ep of the year? Well, definitely a solid runner for that title. This sounds quite different compared to "no boss" 7" released three years ago by Detonate. The production is way stronger and less fuzzy plus the vocals are less reverbed but more yelled. The production reminds me a lot the one of their townmate D-Clone debut full lenght "creation and destroy". I suspect they recorded it in the same studio (I'm too lazy to check). These four tracks are extremely powerful and they have the BEST drum sounds in years. Seriously, all bands should have drums that sound this solid. Like perfectly stated in the last issue of Distortion Faith 'zine, lately the quality level of noisepunk records seriously dropped down. But thanx visnù there are bands like Attack SS out there to prove that even if this sub-sub-genre is hyped and trendy, there's still space for interesting, solid and original records. So please do the world a favour: do NOT start a band that sounds like Confuse or Swankys. Thanx.